All through our lives, from our distant youth onward, people of our generation were repeatedly warned of a dire circumstance threatening the world. It was called "the population explosion," and the warnings came from unimpeachable sourcesearth scientists, demographers, and economists, men whose authority one dared not challenge. Their message was always the same. In Europe, where birth rates are far below replacement levels, the Caucasian race may soon become a beleaguered minority or vanish entirely. Already, workforces cannot be maintained, economies are imperiled, and the most massive migration since the fall of the Roman Empire is replacing the missing Caucasians with Middle-Eastern workers. Since these continue having numerous children, Europe's democracies in the not-very-distant future will yield to Muslim autocracies and her great cathedrals become mosques. Europeans prefer not to talk about this. A French teacher was actually prosecuted for asking her students to calculate the date when France would have a Muslim majority. The newspapers covered the storybut did not reveal their conclusions. Four recent books on the subject are reviewed in the current issue of Touchstone magazine by Leon ]. Podles, one of the magazine's senior editors. * The figures he quotes are more startling than ever. To maintain zero-population growth, women of childbearing age must have an average of 2.1 children, but Spain and Italylowest in Europeare now down to 1.2. In Canada, the province of Quebec is a prime contender for the world's lowest birth rate, but the city of Bologna in Italy, at 0.8, probably still retains that title. And there are other ominous trends. In Vienna, Austria, for example, half the population is single. The inevitable effects are indeed striking. 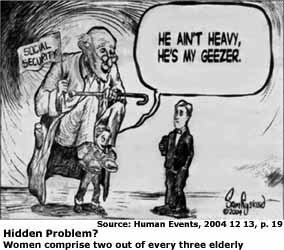 As our population ages, the proportion of seniors expands while the proportion of people who must support them diminishes. Newcomers brought in to do this jobreplacing, in effect, our own non-existent childrenwill soon constitute a majority. But these replacements may not remain all that keen about providing massive tax subsidies for elderly Caucasians. The latest figures for Canada show a much more serious extent of the shortfall of the Canadian 'birth rate'. StatCan reported that, with an average of 1.49 children born to each Canadian woman during her fertile years (age 15 - 49), the fertility rate of Canadian women had in the year 2000 fallen to an all-time low. With a fertility rate of 2.1 children per woman being required to maintain population levels, that puts the shortfall in the fertility rate at 29% for Canada. (The Daily, 2002 09 26, StatCan). In 1999 the Canadian fertility rate was at 1.52.